Like many small businesses, Trophies By Linda, Inc. was born out of a willingness and drive to provide a different product. Current owner Trista Mason recalls how her mother (Linda Smith) got her start in 1983. “She went to buy bowling trophies and thought she could create trophies better and cheaper,” Mason said. 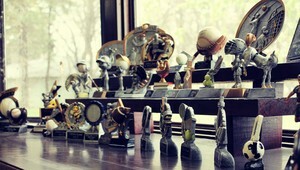 As a result, Trophies by Linda was born in Smith’s basement – later moving to their current site at 10550 County Road 81. Working closely with customers, from a single employee appreciation to an event with hundreds of attendees, Trophies by Linda fulfills orders for trophies, plaques, and awards from their 2,000-square foot Maple Grove location. For the last 22 years, along with a staff of four employees, the Maple Grove business focused on building long-term relationships with their customers to symbols of accomplishment and recognition in the community.